Today’s cute fluffy bum has a happy little girl and a grumpy puppy. (Okay, not really. He was about to sneeze when I took the picture.) Eudora is modeling a Bottombumpers One Size Side Snapping All-in-One diaper in Pink Dot. Bottombumpers are made in the USA. Cloth diapers are fun. Valentine’s Day can be fun. Dressing kids up in cloth diapers for valentines day is really fun. I’ve taken a look around the Internet to find the best cloth diapers for Valentine’s Day. There are tons of cloth diapers out there. 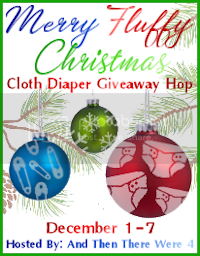 I haven’t used all of these companies, but some of the cloth diapers are so darned cute that I really want to! If I haven’t used the company and am just squeeing over the sheer cuteness, I’ll say so. In honor of the Duke and Duchess of Cambridge’s wedding, Charlie Banana came out with a lovely diaper with hearts. For the boy, there’s the William and for the girl, there’s the Kate. Both have hearts on them, and are perfect for Valentine’s Day. Plus, the diapers are cute and just plain work. Have you seen the new Bottombumpers line up that they announced at the ABC Show? The red diaper with white polka dots just screams “Happy Valentine’s Day!” As for the amazingness of the diaper, I’m still uncertain. I have one, but I’m just not quite sure I get it. Sure, I’ve said in my review of Sunbaby diapers that you get what you pay for. But Hello Kitty is super cute. And Hello Kitty in hearts is even cuter. On the bright side, if your Sunbaby diaper fails after a few weeks, at least you didn’t spend much on it. Ever since getting my first WAHM diaper from Diapers by Chris, I’ve become increasingly enamoured with the idea of shopping Etsy shops. I haven’t tried anything from Little Britches with Unique Stitches, but the cuteness (and gender neutrality) of her Snoopy diaper has me considering it. Nevermind the pink inner; no one will see that, anyway. I typically don’t do covers because I mainly use things that already have the PUL in them. However, this PUL cover in the adorable and ever so seasonal conversation hearts from Simple Additions has me ready to use my prefolds as diapers instead of as extra inserts for my super soaker son. Really, what says Valentine’s Day more than conversation hearts with sweet little phrases?